Whether a twist, trauma or wrong step, one of the most common ankle injuries is a lateral (outside) ankle sprain. An ankle sprain is a strain or tear to the ankle ligaments, which are strong bands of tissue that stabilize and hold a joint together. The most common ligament injured is the Anterior Talofibular (ATF) ligament, followed by the Calcaneofibular (CF) ligament. Ankle injuries to the medial (inside) of the ankle do happen but are not as common as a ligament ankle injury. Ankle sprains usually occur while the foot is in its most vulnerable position; when you’re up on your toes, also known as plantar flexion. 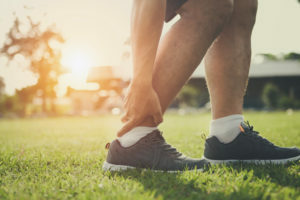 Whether walking down the stairs, working out, or playing sports, an ankle injury can happen in any activity. You may feel your ankle roll, hear a pop, or experience immediate pain and swelling. You may find it extremely difficult to move your ankle and/or painful to put weight on your foot. Other symptoms may include bruising and instability. Recovery time and returning to play will depend on the severity of the injury. First-degree sprains typically heal within 1 to 2 weeks, but severe ankle sprains can take up to eight weeks. The general rule of thumb for treating an ankle injury is PRICE (Protect. Rest. Ice. Compress. Elevate). Protect the ankle from further injury by wearing a brace. Rest the ankle to allow it to heal. Ice the ankle to reduce swelling and pain. Compress the ankle to decrease swelling. Elevate the foot to diminish the blood flow to the injured area, which helps reduce swelling. As mentioned above, an ankle brace can help (or helps) protects the injury. It can help speed up recovery and prevent re-injury to the ankle once you’re back on the field. 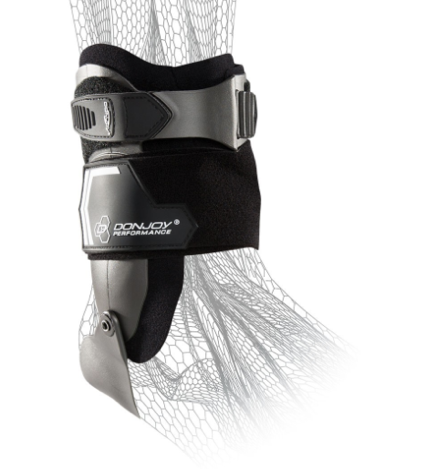 One ankle brace option is the Bionic™ Stirrup Ankle Brace. The Bionic™ Stirrup Ankle Brace delivers medial and lateral ankle protection and support and helps prevent ankle rolls. Also, this brace allows for full range of motion and provides comfort. It’s easy to put on and can fit it most shoes. In conclusion, give yourself plenty of time to recover and rehab back the ankle back to health so you can perform confidently when back on the field. Shop now for your ankle brace.